It's Halloween week! Last week I was so sick I felt like I was dying. This week, I'm actually dead. 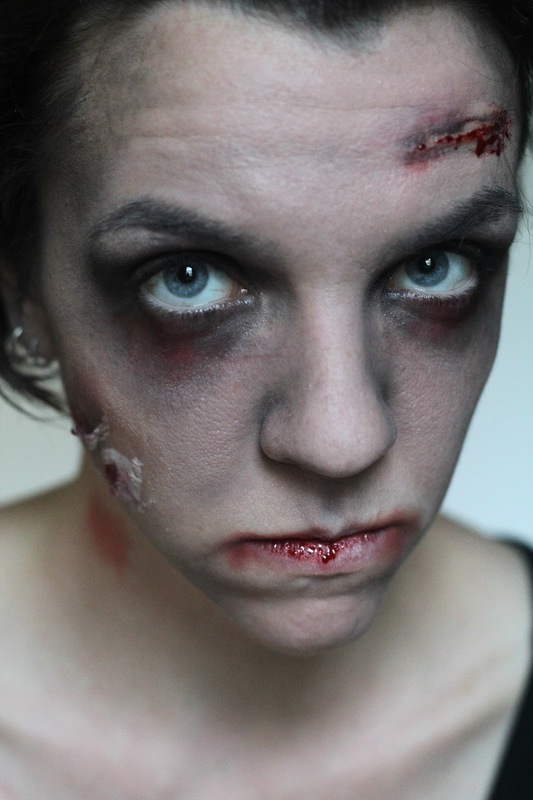 The whole zombie shtick is great for Halloween because it's versatile. It works as a stand alone costume, or it can be combined with literally any other costume for a new twist. Zombie bride, zombie milkman, zombie Velma Dinkley, etc., etc. 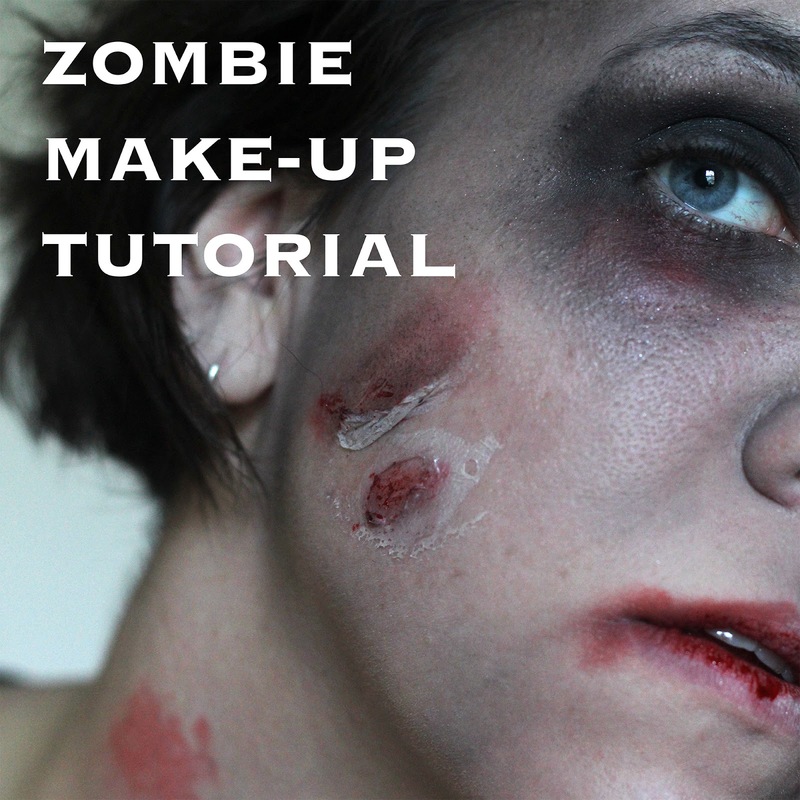 Plus the undead look can be achieved using mostly stuff you already have in your makeup kit. Step 1 // Start off with a fresh, clean face. Step 2 // Apply foundation all over your face, including your lips. Then apply baby powder all over face & lips. 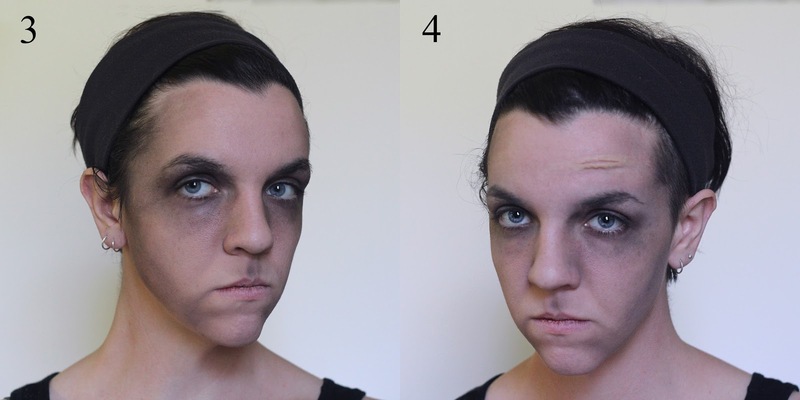 Step 3 // Start building up your contouring lines with any dark powder make-up you have on hand. This is where I used some of my Cuts & Bruises Wheel, but it's totally not necessary. 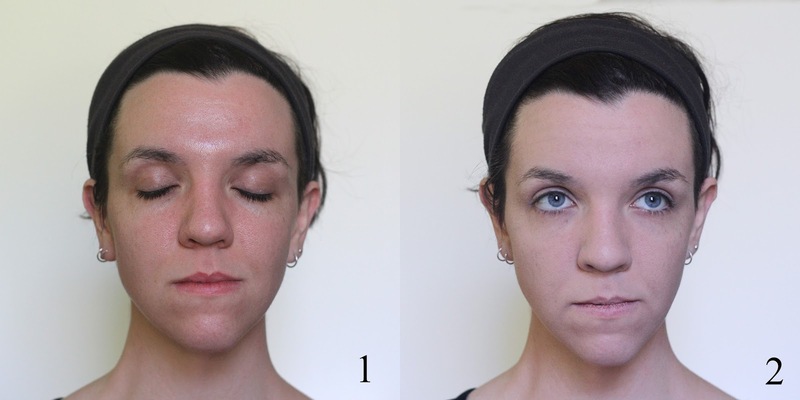 Blacken out your eyelids & under your eyes. Darken under your cheekbone & on either side of your forehead & nose. The goal is to highlight your bones & make your face look sunken in. Use green hues on your skin & blacks around your eyes. While conturing, apply baby powder to blend. Step 4 // When you're satisfied with the look of your skin, apply a thin line of wax on a part of your face where you want to form a cut. Smooth the wax to blend in with your skin. With a pointed object, draw a thin line along the middle of the wax to form the opening of the wound. 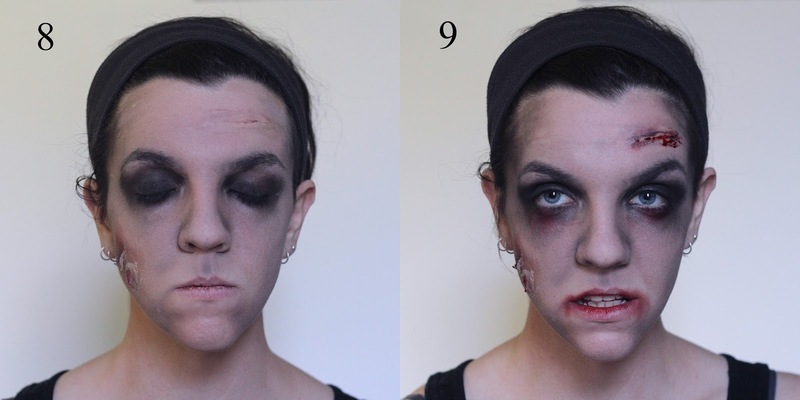 Step 5 // On a part of your face where you want "dead skin," apply a patch of tacky glue. Step 6 // When the glue has completely dried, begin to slowly pull at it, but don't pull it off (remember, like you used to do in elementary school with Elmer's glue? Ahh!). 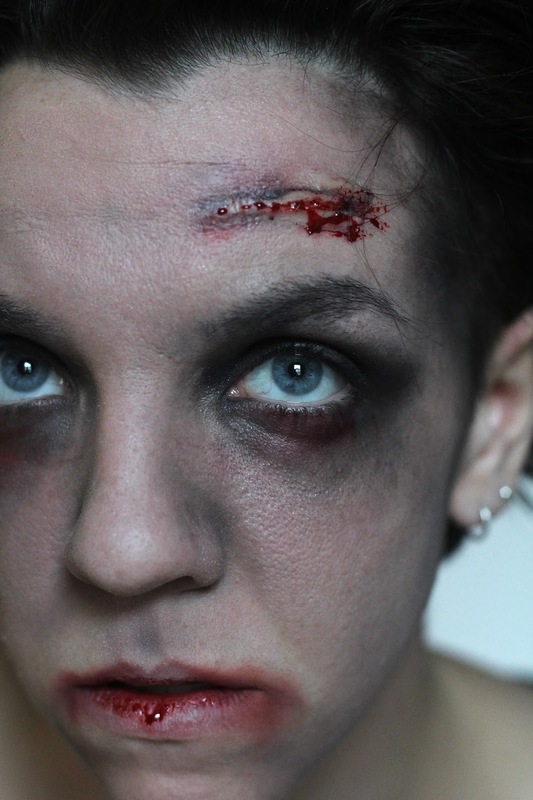 Step 7 // Apply red & black hues on the areas around the "dead skin" to make the wound look fresh & bruised. Step 8 // Continue to blend & contour your face. Mixing foundation & powder make-up will appear smoother on your skin. Apply red & black hues to the "opening" line in your wax wound. Step 9 // Fill the "opening" line in your wax wound with fake blood using a q-tip, allowing fake blood to drip. 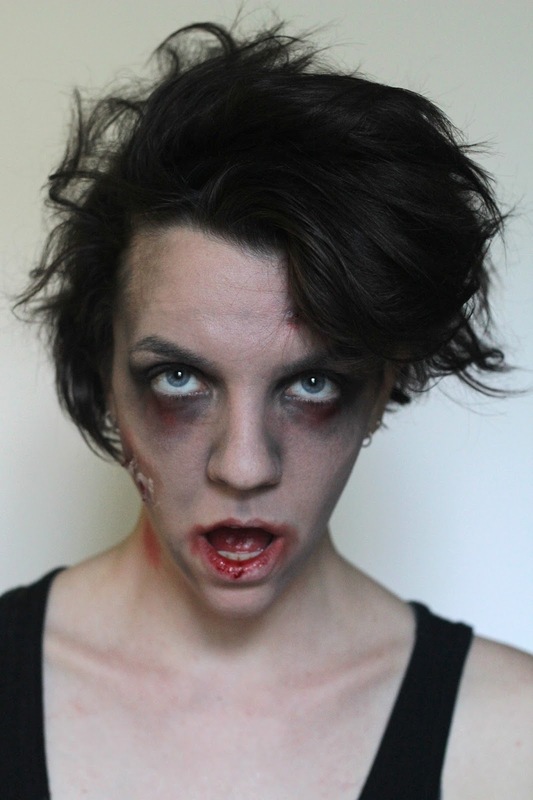 Apply fake blood to the very inside of your lips to get that post-meal look. I also rubbed some red around my mouth & under my eyes. Related // Get in the Halloween spirit with some glitter skull votives.